Sri City, January 2, 2016:- Mr. M. Venkaiah Naidu, Union Minister for Urban Development, Housing and Urban Poverty Alleviation and Parliamentary Affairs visited Sri city on Saturday for releasing the first set of Metro rolling stock for Kochi Metro project. On his arrival at helipad, Mr. Ravindra Sannareddy, Managing Director, Sri City gave a warm reception. 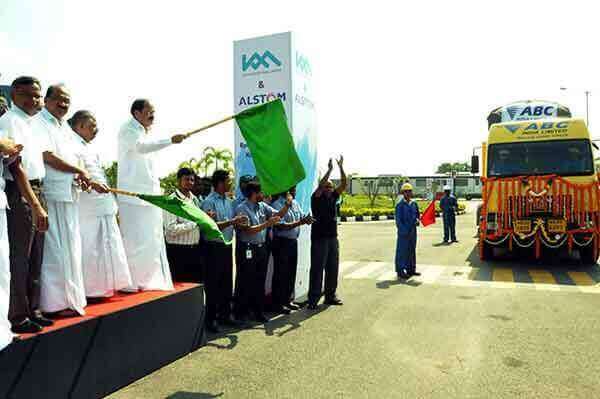 Later, at the Alstom Transport India’s production unit, in a colourful ceremony, M. Venkaiah Naidu officially released and flagged off the first set of coaches for the Kochi Metro Rail, in the presence of Minister for Power, Govt., of Kerala Mr. Arayadan Mohammed, Mr. K.V. Thomas, MP of Kochi, Mr. V. Varaprasad Rao, MP of Tirupati, Dr. Sridharan, Former MD, Delhi Metro, Mr. Elias George, Managing Director, Kochi Metro Rail Limited (KMRL), Mr. Jean Francois Beaudoin, Dy. Senior Vice President, Alstom, Mr. Bharat Salhotra, Managing a Director, Alstom Transport India, and a host of other dignitaries. Mr. Venkaiah Naidu urged the chiefs of industrial units to create employment for the youth in the neighbouring region, and requested them to take up good projects benefitting the villages under corporate social responsibility. Commenting on the occasion, Mr. Ravindra Sannareddy said,”We take pride in the fact that Alstom Transport India is supplying the very first set of ‘Made at Sri City’ coaches to Kochi Metro Rail project. According to Alstom, the coaches for Kochi Metro Rail are one of the most cost-efficient coaches, and are the first ‘make in India’ coaches, designed and manufactured in Sri City. Alstom was awarded a contract to supply 25 state-of-the-art Metropolis train sets to Kochi Metro, and now the first train sets is ready for delivery. As per the contract, Alstom is responsible for the design, manufacturing, supply, installation, testing and commissioning of 25 standard track gauge trains. Each train will be composed of 3 cars, about 65 m long and with a capacity to carry up to 975 passengers.